For decades Canadian cities have stood-in for American cities in movies. That soon may be true for tourists too. Recently, MetroNews published a piece looking at what Canadian cities tourists might consider visiting this year rather than American cities given the turmoil south of the border these days. The Core shopping centre links Calgary's historic Hudson Bay department store with the flagship Holt Renfew fashion center. While MetroNews picked off the obvious ones i.e. if you want to go to San Francisco go to Vancouver. If you are thinking Chicago, think Toronto. If thinking Washington Ottawa would be a good alternative. And Quebec City is Canada’s equivalent to New Orleans while Halifax is our Boston. However, given my travel experience, I thought I’d share my suggestions that might not be so obvious. You never know what you might encounter on Calgary's the River Walk in East Village. Yes, Calgary has funky salvage yards (Ramsay) and flea markets (Hillhurst) for the urban scavenger. One measure of a cool city is how fun are their window displays. When in Calgary, shop where Cher shops when she is in town. If you are considering a trip to Austin, Portland, Nashville, Denver or Seattle might want to consider Calgary (you could add in Dallas and Houston, but that seems too obvious). Politics aside, dollar-wise, a Canadian destination makes good sense. Like Austin, Calgary’s vibrant City Centre with has lots of shops, café and restaurants and funky urban streets. While Austin’s outdoor playground is Ladybird Lake, Calgary’s is its two pristine rivers that form the hub for its 700+km of pathways and 5,200 parks. Yes, bring your bike, as this year will see the completion of the 138 km Rotary/Mattamy Greenway, a multi-use pathway that circles the city. Walking, running or cycling along the Bow River through downtown is the quintessential Calgary experience. Calgarians love to get out and enjoy their 325 days of sunshine. Downtown's Calatrava Peace Bridge is a popular spot. Calgary's Elbow River is a popular padding, rafting and swimming spot. Further along the Elbow River locals enjoy the grass beach at Stanley Park. St. Patrick's Island Park is Calgary newest urban playground. While Austin and Portland are known for its known for their hipster hang-outs, Calgary is a mecca for GABEsters (young geologists, accountants, bankers, brokers and engineers) who love to play just as hard as they work. You will want to check out places like Bridgeland’s Cannibales - barbershop, cocktail bar, sandwich shop. Link: Calgary & Austin: Sister Cities? Even in the winter, Calgary's GABEsters like chill-out 17th Avenue's patios. This photo was taken in mid-March at the Ship & Anchor which is perhaps the heart of Calgary's hipster community. Calgary has one of the largest cosplay festivals in Canada, including a fun parade through the streets of downtown. Calgary’s year-round music festival includes Sled Island Music & Arts Festival, X-fest, Country Thunder, Calgary International Folk Festival, Calgary International Blues Festival, One Love Music Festival (Western Canada’s largest hip-hop festival), ReggaeFest, and Honens International Piano Competition just to name a few. Plan carefully and you won’t be disappointed. Calgary is home to dozens of live music venues along its Music Mile. Calgary's International Folk Festival on Prince's Island lets you get up close and personal with the performers. Calgary International Folk Festival's Main Stage on the lovely Prince's Island. While Portland is the darling of many urban planners, Calgary actually has as much or more to offer when it comes to quirky urban villages. While Portland its Pearl District, Calgary has Kensington, Mission, Bridgeland, Inglewood, 17th Ave and the Beltline (perhaps the hipster capital of North America?). Denver has its popular 16th Street Mall, while Calgary has Stephen Avenue Walk that is lined with shops, restaurants and patios. It is home to the historic Hudson Bay store (Canada’s iconic department store), the Core shopping centre, a flagship Holt Renfrew store and the Glenbow Museum. 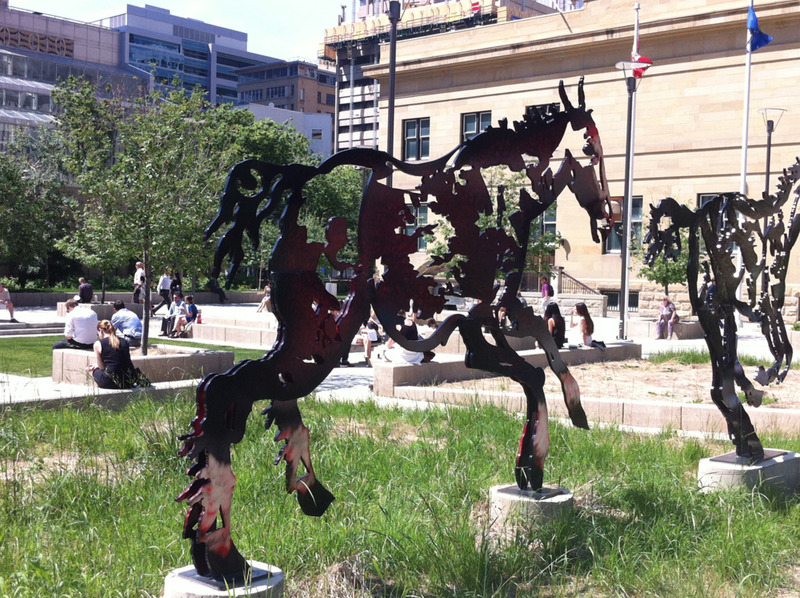 Like Denver, Calgary’s City Centre is also home to 100+ public artworks; they are literally everywhere – from parks to plazas, from pathways to office lobbies. Jaume Plensa's "Wonderland" sculpture of a young girl's head allows you to walk inside and see Calgary's urban landscape from a unique perspective. Calgary is home to several street artists. Calgary's City Centre is full of lovely public art, parks and plazas each with their own character and charm. We like to put the PUBLIC into our public art. If you like Seattle for its tower, the Calgary Tower is taller. If you like Seattle for MoPOP (Museum of Pop Culture), Calgary has the aforementioned National Music Centre, which by the way was designed by a Portland architect. Heritage Posters and Music if you are into collectables or Recordland if into vinyl. If you like coffee and café culture, Calgary is a hidden gem with a number of local roasteries and independent cafes. Maybe start with Monogram Coffee, co-founder Benjamin Put placed third in the World Barista Championship (2016 and 2015). You will also want to check out Phil & Sebastians in the Simmons Building in East Village. Purple Perk has been a popular coffee house in Mission for years. Cafe Beano is popular with both the artists and GABEsters. The Oak Tree's patio is a popular chill spot in Kensington Village. Calgary like Seattle, Portland and Austin is becoming a culinary destination with the several of the best new Canadian restaurants opening over the past 10 years. In fact, Chef Jinhee Lee recently won the 2017 Canadian Culinary Championship. And not only is the food good but so are the settings – Calgary Tower with a revolving restaurant offers up spectacular, city, prairie and mountain views with fine dining. Or you can dine in the 100+ year Deane House downtown or the majestic Bow Valley Ranch in Fish Creek Park (one of the largest urban parks in the world.) River Café on an island downtown in the middle of the Bow River offer some of the best Rocky Mountain cuisine anywhere. 10 restaurants, 7 courses and 280 people enjoy dinner on Stephen Avenue's really really really long table. Yes Calgary also boasts some of the best and biggest parks in North America including one of the world’s largest public skateboard parks. And the Calgary Zoo located on a downtown island in the Bow River (one of the best fly fishing rivers in the world) is simply bucolic. On Sunday our fishermen like to get dressed-up. The Eau Claire Promenade is a strollers paradise. It is also home to some amazing used bookstores, one of North America's largest performing arts centers and one of Canada's largest history/art museums - Enough said? Stay tuned… the next blog will look at how visits to Canadian cities like Winnipeg and Edmonton compare to Chicago and New Orleans. Editor's Note: All of the photos in this blog were taken within 3 km of downtown.